This article appeared in the September edition of the Huaraz Telegraph under the title ‘Introducing Project Cordillera’. Visit www.thehuaraztelegraph.com for more interesting news on Huaraz and the Ancash region. What does Huaraz mean to the people who visit it? To many, it is one more stop on a breakneck tour of South America. To some, it is the start of an adventure. Trekking through the stunning Huayhauash range or Santa Cruz valley, or climbing the famous peaks of Alpamayo, Artesonraju and Pisco. For us it was the start of a project – Project Cordillera. It could be any other town on the edge of the Andes. Diesel fumes, stray dogs, rainy in the off-season, sunny when it wants to be. In my first few timid days while I ran around dodging taxis and making plans, the mountains that hung above the town seemed like a set in a theatre production that could be lifted at any time to reveal stagehands running around and laughing. When you get up close and personal with the mountains you realise that they were lying to you. They were pretending to be big, just to lure you in. You travel towards them and seem to get no closer as they rise like an optical illusion, bigger, much bigger, than you ever could have imagined. There is an unreality to the place that leaves you always anticipating the next adventure and dares you to try something different. 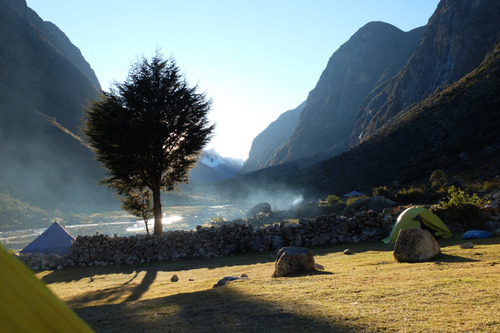 Project Cordillera is a social enterprise that provides high quality mountain experiences in Peru, while sharing half of the profit with a local NGO. By helping to empower and educate we aim to make tourism a more equitable enterprise. We want to change the way that people think about their trip, as something not just for them but also for the community they are visiting. Travelling is about more than turning up, pressing the camera shutter and leaving. This summer I had the opportunity to visit the community centre at Yurac Yacu just outside Huaraz to watch kids take part in a Project Cordillera sponsored training programme. The summer course teaches teenagers a range of skills so that they can become “Guías Locales” – taking trips around the region where they have grown up, so helping to strengthen the economic base of this Andean community. More importantly, the course teaches leadership skills that are transferable to all aspects of their lives, meaning that no matter what they end up doing their community will be enriched. Leaving life in South London for Peru and everyone has one question, “Trekking to Machu Picchu?” When you explain that you’ll be heading in the opposite direction to visit the Cordillera Blanca they’ll look blank and admit that they’ve never heard of it. Sixteen different six thousand metre peaks, world-class trekking and rock climbing, mountain biking, paragliding and some of the most amazing scenery I’ve ever seen seem to have slipped off the map of Peru. Which is strange, because when you leave all you can think of is the things you didn’t have time to do. You remember the friendly locals and mad gringos. You remember cursing at the cold and basking in the sun, smiling over ice-cold beers. And you only hope that you’ll be lucky enough to return. So what does Huaraz mean to you? Visit www.projectcordillera.org to find out more about what we do. Got a story to share, or interested in helping out? 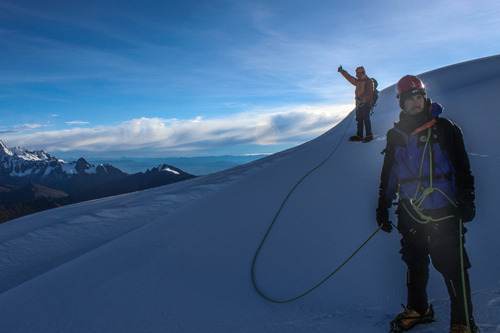 Get in touch and let us know your thoughts on Huaraz, your adventures and our project. Filed under Get Inspired, Get Ready. Tagged alpamayo, artesonraju, huaraz, huarazperu, huaraztelegraph, machu picchu, machupicchu, pisco, santacruz, travelperu. Who doesn’t like a beautiful big ridge line?